Prime Minister Narendra Modi dedicated the Deendayal Urja Bhavan, the Oil and Natural Gas Corporation's (ONGC's) Corporate Office, during the nationwide launch of PM Saubhgya Yojana, to the nation. The Prime Minister also unveiled the statue of Pandit Deendayal Upadhyaya at the ONGC premises in the presence of Minister for Petroleum and Natural Gas Dharmendra Pradhan. "Prime Minister Modi also dedicated the Booster Processor facility, BCPA 3 platform of ONGC's Bassein and Satellite Asset in the country's Western Offshore via Video Conference. The project will provide an expected cumulative gas gain of 18.83 BCM with incremental peak gas rate of 9.10 MMSCMD, which will add to ONGC's gas production," said a press release by the ONGC. The Deendayal Urja Bhawan has been awarded the highest LEED (Leadership in Energy and Environmental Design) Platinum Rating by U.S. Green Building Council. The ONGC building is a symbol of harmony between Energy and Ecology. It is an environmentally-sustainable building that has been designed, constructed and operated to minimise the total environmental impact by reducing energy consumption, water conservation and recycling waste. The project has been registered as a CDM (Clean Development Mechanism) Project with the United Nations Framework Convention on Climate Change (UNFCCC). 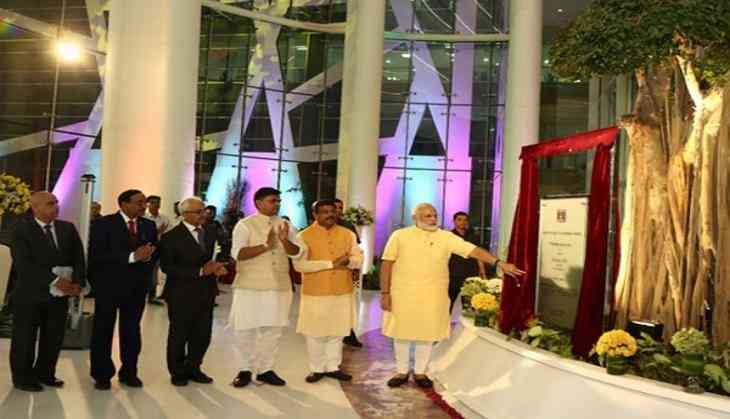 The ONGC further said, "The Prime Minister also launched ONGC's Paperless Office Project called DISHA at ONGC's Ahmedabad Asset through Video Conference. The project envisages carrying out regular office jobs without physical movement of paper documents or files." Prime Minister Modi, along with the other dignitaries earlier visited the 'Knowledge Centre', a state-of-the-art Audio Visual experience zone created in the building. The dignitaries experienced the technological marvel of Deendayal Urja Bhawan and its unique features as well as ONGC's glorious journey of over six decades through captivating digital displays. Prime Minister Narendra Modi on Monday launched Pradhan Mantri Sahaj Bijli Har Ghar Yojana or the Saubhagya Yojana with a target to complete electrification of the entire nation by March 31, 2019. He launched this scheme on the birth anniversary of Pandit Deendayal Upadhyaya. The Government of India will be spending total Rs. 16,320 crore in this massive project to provide electricity and to give the nation a new light. The rural household expenditure is estimated to be Rs. 14,025 crore, with Rs. 1,732.50 crore is being allocated for urban households. The gross budgetary support for the scheme will be Rs. 12,320 crore. Under the Saubhagya Yojana general category, the states will get a grant of 60 per cent from the government while, the special category states will be bestowed with 85 perc ent grant. The state government will contribute 10 percent of the total expenditure for the general state and 5 percent for special category sate. The remaining amount will be covered by loans from financial institutions and banks. The project will concentrate majorly on states like Bihar, Jharkhand, Uttar Pradesh, Madhya Pradesh, Odisha, Jammu and Kashmir, Rajasthan and other North-eastern state. For the household with no electricity located at remote and inaccessible areas, the government will provide battery bank and solar power pack of 200-300 Wp. The bank will consist of five LED lights, a DC fan, five DC power plug and will provide repair and maintenance facility for five years. The main agenda of this Yojana is to provide substitution to kerosene, improve educational services, improve health services, improve mode of communications, improve in public safety and increase job opportunity.